Five months after introducing the OnePlus 5, the crew at OnePlus has revealed an updated version of its flagship smartphone. The OnePlus 5T is now official. Perhaps the biggest draw of the 5T is its display, which is taller than the screen on the OnePlus 5 and also has slimmer bezels. 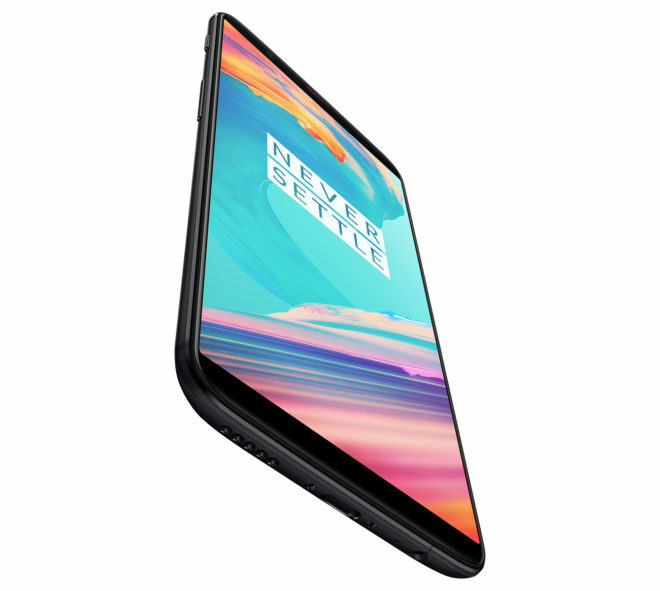 OnePlus has equipped the 5T with a 6.01-inch AMOLED display with a resolution of 2160×1080 and an 18:9 aspect ratio. That larger screen is packed into a body with a size similar to the OnePlus 5. Like the OnePlus 5 before it, the OnePlus 5T has a dual rear camera setup. Things are a tad different with the 5T, though, because OnePlus ditched the telephoto lens found on the OnePlus 5 for a 20-megapixel secondary camera with a Sony IMX376k sensor, f/1.7 aperture, and a focus on low light performance. The OnePlus 5T also offers the same 16-megapixel rear camera with IMX398 sensor wide angle lens as the OnePlus 5. 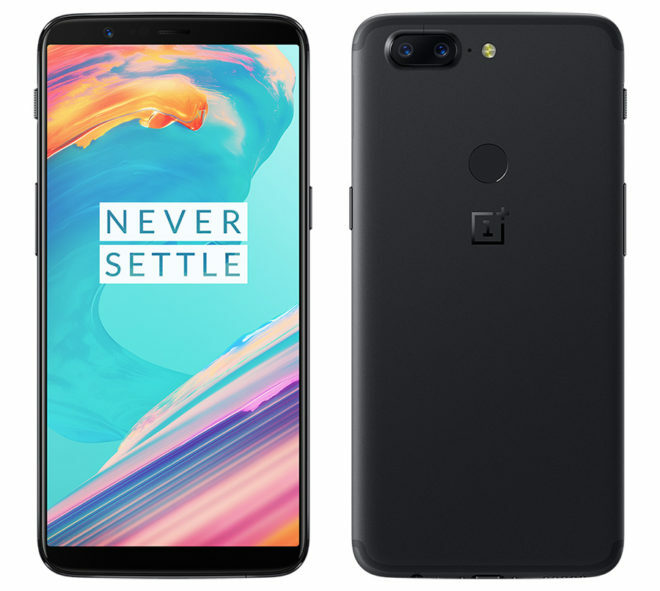 Many of the other specs of the OnePlus 5T are similar to the OnePlus 5. There’s an octa-core Snapdragon 835 processor here, 3,300mAh battery, 16-megapixel front camera with IMX371 sensor, USB-C, Dash Charge fast charging, and a 3.5mm headphone jack. There are two versions of the 5T, just like the 5, one with 6GB of RAM and 64GB of built-in storage and one with 8GB of RAM and 128GB of storage. There’s a fingerprint reader on the OnePlus 5T, too, but it’s been moved from its placement on OnePlus 5 because of the 5T’s reduced bezel size. The 5T’s fingerprint reader is on the back of the device, right above the OnePlus logo. OnePlus has also added a Face Unlock feature to the OnePlus 5T which identifies 100 points on your face and can unlock your phone in 0.4 seconds. On the software side, the OnePlus 5 comes with Android 7.1.1 Nougat out of the box below OnePlus’s custom OxygenOS user interface. OnePlus says that it’ll offer an Android Oreo open beta for the OnePlus 5T in late December and that both the OnePlus 5 and 5T will get a stable Oreo update in early 2018. The OnePlus 5T will launch in the U.S. on November 21st. Pricing will start at $499 for the 6GB/64GB model and go up to $559 for the 8GB/128GB model. Returned my Pixel 2 XL and going to order this in the 8/128GB variant. Do not care if it is missing Band 71 (600). just know that this phone’s screen does have this weird rainbow effect when tilted. Maybe its not a big deal for you, but it does. I am thinking about getting it, but I heard a lot of negative reviews regarding 1+ customer service and how they deal with customers if they have issues. At first glance (in the videos) the rainbow effect appears to be at the far extremes, unlike the 30-45 deg that I’ve seen on my returned Pixel 2XL. So that won’t bother me. I’m between this phone, Essential phone and Pixel 2XL. Every fiber of my being wants the Pixel 2XL but my frugal side tells me to get the Essential phone or the OP5T…too many tough decisions. I’ve had my Nexus 4 for exactly 5 years now and I’m not just going to upgrade to anything it needs to be absolutely spectacular! Haha. I feel you. The thing about the Essential phone that would concern me is their level of support. Didn’t Essential go through a whole lot of executive management drama? OnePlus is a few generations in and I’ve read mostly good things about them. That 8gb/128gb model for $559 sounds like a BEAST! Definitely buying this on Tuesday. Let’s hope that there’s enough in stock. Wish I could see this before buy it. I was about to get the x but when I saw it I was really disappointed as it is a small phone. This is super petty but OnePlus phones can’t respond to “Okay Google” with the phone unplugged and the screen off. For me and my job, that’s a must-have feature. Otherwise, this would be my phone. Congratulations! First review that mentions bands, the rest seem to think nobody will ever use this as a telephone. Will this work with T-Mo wifi calling? THis is the most frustrating thing about reviewers. When reviewing phones that are mostly going to be bought from someone other than their carrier they don’t mention all of the band, wifi calling, Volte, etc. It makes it hard to buy phones that are not specifically made for your carrier.